August 28, 2015 - The Federal Aviation Administration (FAA) dedicated its new National Airport Pavement & Materials Research Center at the William J. Hughes Technical Center at Egg Harbor Township, N.J. The research center is a unique facility that allows FAA engineers to use a custom-designed vehicle simulator to test asphalt and other pavement materials at very high tire pressures and temperatures. Airport pavement temperatures can reach 140 to 150 degrees Fahrenheit as far north as New York City. Tire pressure ranges from 220 to 250 pounds per square inch on new generation aircraft like the Boeing 787 and Airbus 350. The vehicle simulator has an automated heating system that allows engineers to replicate and analyze the damage that heavy commercial jets can cause to the top asphalt layer when runways are hot. The vehicle was designed to simulate the behavior and weight of aircraft tires, and can show how repetitive aircraft operations affect pavement. 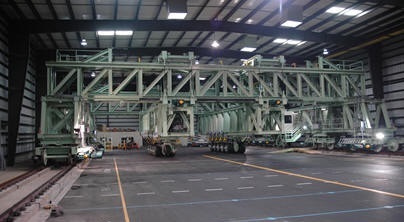 FAA engineers will move the Heavy Vehicle Simulator-Airfields (HVS-A) by remote control between four outdoor pavement test strips and two strips inside a new building, to allow for testing in a controlled environment. FAA engineers recently used the HVS-A to test the performance of airfield paint markings. The HVS-A is 130 feet long, 16 feet wide, 14 feet tall and weighs 240,000 pounds. The new center will enable the FAA to research environmentally-friendly airport pavement materials such as warm-mix and recycled asphalt pavements. The FAA’s goal is to expand the use of “greener” materials, and pavement materials that can be modified to enhance pavement durability, workability and strength. This will help airport operators save money by lowering the costs of initial construction, maintenance, and repairs, and will provide a longer pavement life. The FAA has not recommended the use of environmentally-friendly airport pavement materials yet because research on the effects of aircraft tire pressure and heavy gear loads on green airport pavement materials has been limited. Construction of the test facility began in August 2013 and was completed in May 2015 at a total cost of $3.8 million. The FAA accepted delivery of the $4.2 million HVS-A on November 1, 2013.